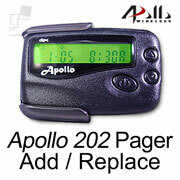 These are individual Apollo 202 side-display pagers that can be used with various Apollo pager transmitters. The 202 shows numeric messages on a large display. Durable and economical, typical uses include numeric messaging to staff such as which restaurant table or exam room is calling for service.... more. These are individual Apollo AL-A24 (formerly AL-924) side-display pagers that can be used with various Apollo and ARCT pager transmitters. The AL-A24 shows full alphanumeric messages on four-line displays of up to 200 characters. Typical uses include urgent and specific messaging to managers and staff ... more. These are individual Apollo Gold AL-A25 (also called "ALA25S" and "929") side-display pagers that can be used with various Apollo and ARCT pager transmitters. The Gold AL-A925 shows full alphanumeric messages on four-line displays of up to 200 characters. Typical uses include urgent and specific messag... more. These are individual Apollo Gold AL-A27 (also called "A27" and "ALA27S") side-display pagers that can be used with various Apollo and ARCT pager transmitters. The Gold AL-A27 shows full alphanumeric messages on four-line displays of up to 200 characters. Typical uses include urgent and specific messagi... more. 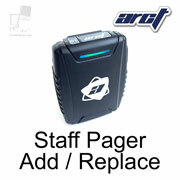 These are individual ARCT staff pager transmitters (model ARCT-0005) that can be added to ARCT Staff Pager Systems to expand, repair or upgrade your current staff paging system. 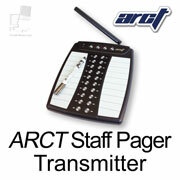 The ARCT Staff Pager Transmitter is ideal for offices, clinics and restaurant kitchens. It has twenty one-touch buttons with adjacent dry-erase button label for... more. 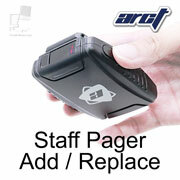 These are staff pager expansion kits for ARCT pager systems. This set includes five or ten of the standard small black pagers used by staff or servers and a 10-bay charger set. 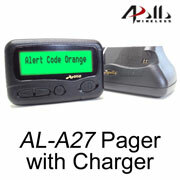 Order this item as part of a custom pager system or to expand your current system or replace missing or broken equipment. (Note: These ARCT brand ... more. These are individual staff pagers by ARCT ARCT that are the standard small black pagers used by staff or servers that are usually clipped to a belt (model SP-01 with no display). 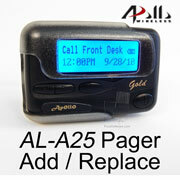 Order this item as part of a custom pager system, to expand your current system or replace missing or broken pagers. (Notes: These ARCT b... more. These are individual staff pagers by ARCT that are the standard small black pagers used by staff or servers that are usually clipped to a belt (model SP-01-ND with numeric display). 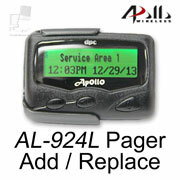 Order this item as part of a custom pager system, to expand your current system or replace missing or broken pagers. This pager displays numeric messa... more. These are individual ARCT PT-01 push-for-service pager transmitters that can be added to ARCT Staff Pager Systems to expand, repair or upgrade your current staff paging system. 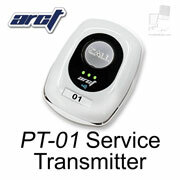 Place ARCT PT-01 push-for-service pager transmitters everywhere you wish so anyone may conveniently contact your staff. Small and rounded, the tra... more.